Pretty pastels and flowing florals meet retro rockabilly silhouettes in the designs at Voodoo Vixen. This spunky shop is located in fashionable East London, UK, but its designers are based in Los Angeles as well, creating vibrant vintage looks to delight rockabilly princesses worldwide. Beginning with 1950’s pin up style in mind, Voodoo Vixen aims to create flattering styles for the wide range of body types of today’s modern women. Their high quality fabrics are made of custom prints and patterns designed in-house right at their London and L.A. studios. 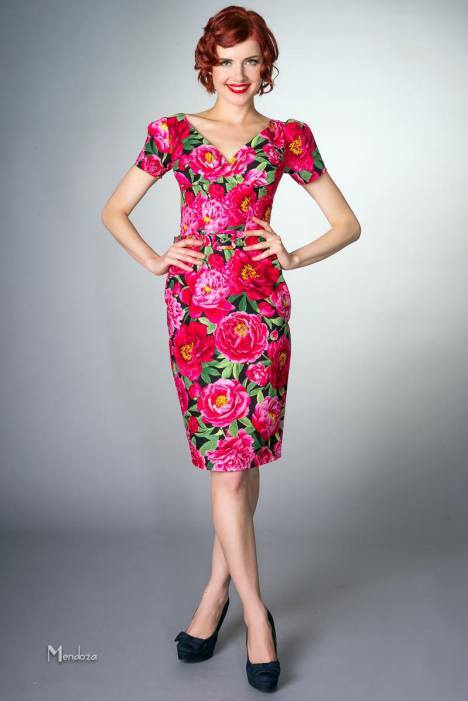 The wide selection of pin up dresses, vintage cardigans, retro tops and bottoms, and even playsuits and rockabilly accessories appear in fun prints and fabrics that you won’t find anywhere else. Because fabrics are the focus, shoppers can find the same black and white paisley or red polka dot pattern in a pencil skirt or A-line pin up dress. It’s easy to find a pattern to suite any vintage style and then mix and match different silhouettes to suit any body type. To this aim, Voodoo Vixen also features an entire line of plus size options. 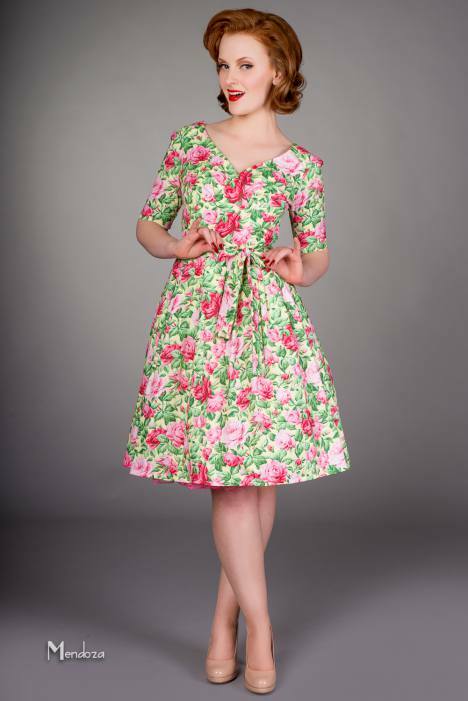 Gorgeous pin up dresses and vintage cardigans in their unique fabric prints are available up to size 4XL. Voodoo Vixens website is fun to browse ‘By Occasion’ where shoppers can select from categories like ‘1950’s Dinerama’ and ‘Rock n Roll Vibes’ for pin up and rockabilly styles. There is even a category for prom and rockabilly wedding dresses for the ritzy glitzy vintage occasion. Whether you’re on your way to an ice cream social or marrying your oldschool sweetheart, these pin up dresses, skirts, cardigans, and playsuits are just the ticket to classic style. In their accessories tab, Voodoo Vixen offers a wide range of retro inspired handbags and purses to match any outfit. Choose from rockabilly skulls and roses to homestyle plaid and polka dots for the perfect complement to your unique vintage style. While Voodoo Vixen does ship internationally, they offer free shipping to any customers in the UK for an added perk. Browse by occasion or size, fabric or silhouette, and everyone is sure to find something to love. JBR Clothing is a retro and vintage inspired store located in California, USA, and the selection available to you isn’t limited to just clothing. They also have a strong collection of charming accessories, pinup shoes and cosmetics. There’s more than a few reasons why this shop can easily become one of your personal favorites. The fashion of the 1940s and 1950s was fun, feminine and a playfully preppy, and JBR Clothing promotes these nostalgic characteristics well. Whether you need a new dress for work or play, you can find an array of chic wiggle dresses, pencil dresses and circle dresses that accentuate the curves that matter. JBR Clothing offers some of the best brands in retro and vintage-inspired fashion, and the labels they feature are loved and well-known by fashionistas all over the globe. From Bettie Page, Steady Clothing and Hell Bunny all the way down to Bordello and Pinup Couture Shoes for your soles, this store knows exactly what you need to look sentimentally chic from head to toe. There’s not much more pinups and rockabellas can ask for in a store, because their inventory is amazing.